Dr. Shah is a Prosthodontist- a specialist in full mouth reconstruction, implant and cosmetic dentistry. Dr. Shah has been providing the finest dental care in utmost professional manner for over 10 years. Although her expertise is in cosmetic and implant dentistry, she also provides exceptional general and family dentistry. 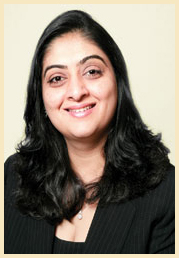 Dr. Shah earned her doctorate degree from NYU-College of dentistry with honors in fixed prosthodontics. Dr. Shah is one of the few recipients of Omicron Kappa Upilson (OKU) membership award. A very small percentage of the dentists in USA are awarded with this membership. Dr. Shah received a Certificate in Prosthodontics after completion of 3 year full-time program in advanced education in prosthodontics at NYU-College of Dentistry. Dr. Shah learned the finest art and science of dentistry and was mentored by some of the best specialists in the country. Dr. Shah was Finalist for FRECHETT AWARD — Highest research award for students after giving a winning presentation in Goteberg, Sweden. Dr. Shah sincerely values the professional relationship with all her patients that have developed as a result of this philosophy, qualification and trust. Dr’s Shah office Riverside Dental Specialties is conveniently located at 905 Allwood Road, Suite 107, Clifton, NJ 07012 the office has ample private parking space and very flexible hours appointment Schedule.